There are many computer forensics firms in the state of Arizona. Many of these Arizona computer forensics firms work closely with lawyers and law enforcement agencies. While it is true that many local, state and federal law enforcement agencies employ their own computer forensic examiners, many private sector examiners can get called in for assistance. Those computer forensics professionals working in law enforcement are paid a competitive wage, but normally are well covered in terms of pension plans and heath care coverage. However, those examiners in the private sector are going to usually make more. Computer forensics is a career field that is still in development. More and more campus colleges are offering a degree in computer forensics. Also in the state of Arizona, many of these degrees are available through distance learning and online schools. With the growing demand for computer forensic professionals, more and more schools are rushing to make computer forensic degrees more readily available for students. And while campus-based computer forensic programs are rare, Arizona currently has two universities with campus-based computer forensics programs. Maricopa County Community College, located in the Phoenix area, offers an Information Security Forensics Certificate. The University of Advancing Technology, located in Tempe offers a bachelor’s in Computer Forensics and a bachelor’s in Network Security. These findings go along with the findings in the field of computer forensics. Being such a new area in the education system, many campus colleges are slowly offering these courses in computer forensics. Across the country there are very few public or private educational schools which have computer forensics degrees available. This is leading most students to online colleges, which work well with a busy schedule. When it comes to standard operating procedure in computer forensics, every state has its own laws and procedures. Currently, Arizona is operating with regards to the Federal Rules of Civil Procedure Amendments. There are no additional state laws or statutes on the books in Arizona concerning computer forensics or data recovery. 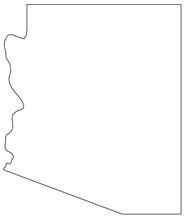 Arizona has adopted provisions similar to the Federal Rules of Civil Procedure Amendments. Arizona is among the majority of the states which require any individual practicing data recovery with the intent of using found information in a court of law be a licensed Private Investigator in that state. This is referred to as electronic discover or e discovery. While this is not an issue for the Law Enforcement Agencies working across the country it could prove to be an obstacle for those working in the private sector as computer forensic “specialists”*. In Arizona the average salary in computer forensics is $65,000** annually. According to the U.S. Department of Labor the mean annual income for all employed in 2007 was $36,260. These are fairly typical findings, as the salaries in computer forensics across the country tend to be far above average. Across state of Arizona the income in computer forensics varies from region to region. Traditionally, larger cities tend to pay better salaries than smaller, more rural areas. Although Phoenix is a more populated area, Flagstaff pays computer forensics professionals a higher salary**.